Small giftbox, made from corrugated cardboard or decorative paper. Decorated and tied with a silky ribbon. 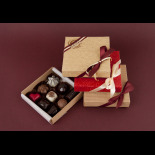 Contains a selection of our handmade chocolates. Net Weight 100 gr. 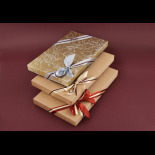 Medium giftbox, made from corrugated cardboard or decorative paper. Decorated and tied with a silky ribbon. 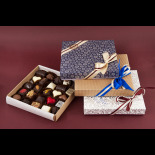 Contains a selection of our handmade chocolates. Net weight 180 gr. Large giftbox, made from corrugated cardboard or decorative paper. Decorated and tied with a silky ribbon. 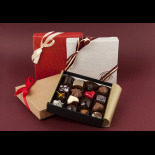 Contains a selection of our handmade chocolates. Net weight 285 gr. Extra large giftbox, made from corrugated cardboard or decorative paper. Decorated and tied with a silky ribbon. 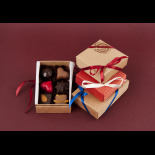 Contains a selection of our handmade chocolates. Net weight 450 gr.